Congratulations, we skipped over the worst part of the quest! 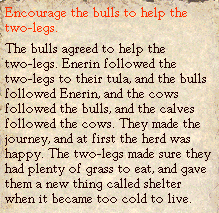 Not only do we not have to deal with biting things, but we also don't have to show the secret sign to Ernalda(or beg for mercy ) or convince the bulls to come back with us. 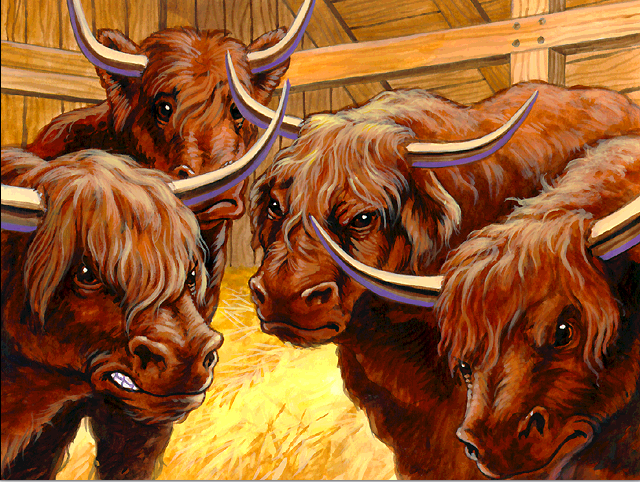 But then the bulls make a terrible discovery. Some of the cows are disappearing! The bulls have seen the two-legs cutting up cow bodies, roasting their flesh, and devouring it as a cow would devour grass! The bulls came to Uralda trembling, their bravado gone. "You tricked us," they say. "Those two-legs are just like the biting things, except now we are trapped!" -"A little lost blood is nothing, when there is life to be given." -"It is the lot in life of four-legs to be eaten by two-legs, who are our masters." -Sing them a maternal lullabye. -"Shut up and obey your mother."